The high strength grout is the result of more than three years of joint development, the primary purpose of which has been to deliver significant and quantifiable improvements in productivity and safety when grouting offshore structures. "FoundOcean recognised a need amongst its customers for a material that could provide high early strength development and low temperature performance, yet also offer increased efficiency, safety and cleanliness," comments managing director Jim Bell on the motivation behind the new development. "MasterFlow 9800 will contribute to driving down the installed cost of offshore renewable energy." MasterFlow 9800 is set to revolutionise offshore grouting, by introducing a high strength grout with unrivalled operational advantages. The material is able to be shipped and stored in silos rather than bags, facilitating quayside storage in all weathers, more flexibility in deck layout and no requirement for bag or container lifting during grouting operations and dockside resupplies. The MasterFlow 9800 grout system uses an upgraded version of FoundOcean’s Recirculating Jet Mixer (RJM). The delivery rates when using an RJM are upwards of 20m³/hr and therefore faster grouting of the annulus can be achieved, saving valuable offshore operating days. The closed circuit between the cement silo and RJM mixer, along with the continuous mixing process, also minimises overage, as well as reducing dust. "Demanding offshore challenges have set extremely high requirements for the grout and grouting works in the development of MasterFlow 9800. 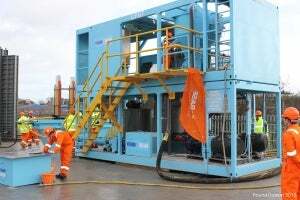 Aligning the excellent properties of the new offshore grout with the operational advantages of FoundOcean’s continuous mixing and pumping equipment will bring major health and safety improvements and installation cost reductions," says Luc Westhof, global key account manager at BASF Construction Chemicals. The material offers a number of superior properties, including excellent early strength development, even at cold temperatures, and high fatigue resistance. When combined with its operational advantages, these properties have the potential to provide significant cost optimisation for the foundation installation, whilst ensuring the durability of the grouted connection. For more information, please contact FoundOcean.